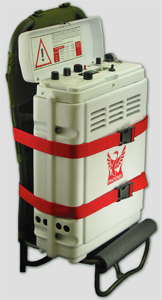 The T-3 is a lightweight, versatile multipurpose signal source for use in a variety of geophysical techniques. Weighing only 12 kg, it is easily transportable on a backpack over virtually any terrain. 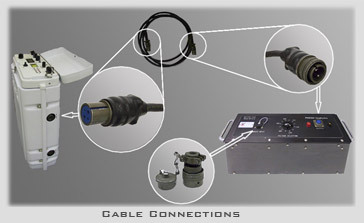 The T-3 can drive either inductive loads (loops) used in TDEM or FDEM techniques, or grounded dipoles used in IP, Resistivity, and CSAMT techniques. Phoenix design experience extends over 40 years, and the T-3 builds on this record. T-3 transmitters have been used in countless field surveys under every climatic condition worldwide. The T-3 can be powered by one or more external 12 V batteries or by Phoenix’s selectable-voltage BP-24/72 battery pack. Alternatively, the power source can be a standard geophysical motor generator, or any of a number of commercially available 50 Hz or 60 Hz motor generators. This flexibility means that the power source (and parts and service) can be obtained almost anywhere in the world. The T-3 can be controlled by a System 2000.net RXU-TM transmitter monitor, with or without radio networking to a V8 receiver. External Timing DC to 16.384 kHz, via cable link to suitable receiver or clock source such as RXU-TM, RXU-TMR, or MTU-TXC. (RXU-TMR includes radio networking with controlling V8-R multifunction receiver.) All Phoenix receivers and clock sources are GPS synchronized.